Denis Fitzpatrick is a university qualified horticulturist with over thirty five (35) years of delivering high quality, sustainable landscape projects. Denis is the owner and principal director of Green Survival Landscapes and has been responsible for steering the company from strength-to-strength of the past thirty five (35) years. Denis is a well known, knowledgeable and respected figure in the landscape industry and is sought after to sit on state and national committees, as a university qualified and professional landscaping expert, as a public speaker and as a landscape awards judge. 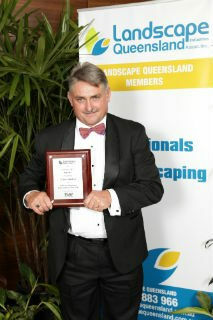 Denis is proud to be a founding member of the Queensland Association of Landscape Industries (now the peak industry body) and has held executive positions including consecutive appointments as president. It is this commitment and involvement to the industry which has enabled Denis to remain as a well known figure in the landscape industry. Denis is a highly experienced project manager and has, through Green Survival; worked on every type of landscape from simple 'shoe box' court yards to large scale landscape construction projects that span over hectares of land.